Birding� (it used to known as bird-watching but that didn't sound cool, and birders are of course cool)�is the most popular and rapidly growing� form of outdoor recreation in America. Besides all of the excellent birding handbooks that are out these days, the Cornell Laboratory of Ornithology has a good basic site for basic info and identification, All About Birds, which we use all the time. They also have an advanced site, The Birds of North America, which is by subscription. Other things that CLO offers: A home-study course on bird biology, behavior,�and identification and the necessary�A Field Guide to Bird Songs. Photo: Two warblers after banding. 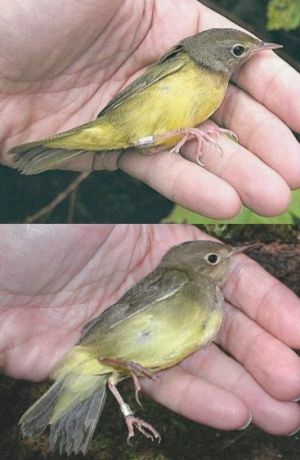 These are immature birds in fall plumage, a Mourning Warbler on top and a Connecticut Warbler below. I do birding entirely by ear. I don't even look for the actual birds - usually I'm commuting on a bicycle anyway - saving a fortune in time and money. Just record what you hear, if it's unknown, and take it home to compare with some bird CD's. I not only did that but posted stuff as I went along http://home.att.net/~rhhardin/index.html way down the page, to learn the stuff. Peterson's Backyard Bird Song is a good novice start, followed by the 3-CD Birding by Ear. At that point the narrator is becoming an intrusion and you can go to the more encyclopedic Stokes Field Guide to Bird Songs, and perhaps More Birding by Ear if you can stand more Peterson narrators and want to fill out the set. To hell with what they look like. You can waste all day trying to figure out what it is by looking. Spoken like a true birder. And they don't look like they'll be getting too much more mature - kind of still, ain't they? When looking for binoculars, I noticed that there are several types: hunting, marine, birding, millitary, etc. What I would like to know is this: how are "opera glasses" different than say small field glasses? Much like buying a computer... depends on your needs. It is a very complicated subject... the 'best' magnifiers. The feature that costs most is optics... in other words... how clearly, crisply and under what light conditions can you see what you are looking at. Next is magnification, an entirely subjective need. From 'opera' to details of craters on the moon. But this part is tempered by 'optics' as above. The hunting, marine, military styles generally mean ruggedness. Impervious to water, salt or fresh, is the major threat that those words connote. My preference is for 'optics'... I like what I am looking at to be absolutely clear. I purchased some Nikon's twenty years ago, which still draw comments from strangers to them, as to how 'clear' they are. So, after all my verbiage... clarity in the lens, magnification, robustness... a workable algorithm, at least for the average user.